Delivery from £11.08 to United Kingdom in 6 - 12 working days. 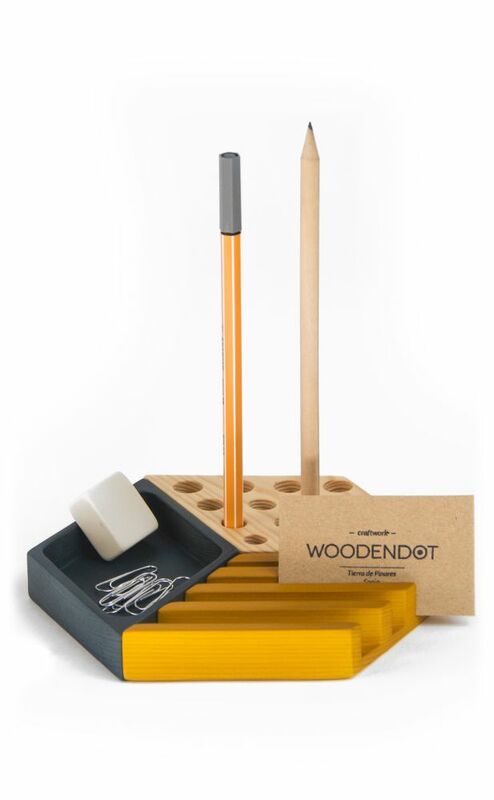 Kesito is a desk organizer that helps us to order those little objects that we always have on hand; pencils, paper clips, business cards and of course, our Smartphone. If you can’t see your desktop for the mess, but the idea of a sterile, tidy workspace is unthinkable, then relax we have designed a desk organizer that maintains the creative flow. Handmade in the Spanish region of Tierra de Pinares using sustainably sourced pine wood, the Kesito Desktop Organizer is made up of three diamond-shaped blocks that can be arranged in a row, a hexagon, or separately. One piece can hold a forest of upright pens, one is slotted for cards, notes, and smartphones, and the third is the perfect spot for pins, paper clips, and other small bits and bobs. Get organized without losing the inspiration of creative chaos.